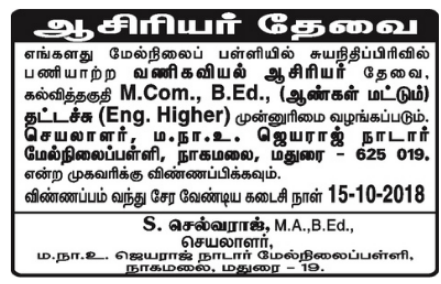 M.N.U.Jayaraj Nadar Higher Secondary School, Madurai has advertised in the DINAMALAR newspaper for the recruitment of Teachers (Male only) jobs vacancies. Interested and eligible job aspirants are requested to apply on or before 15th October 2018. Check out further more details below. About School: Our School is situated on Madurai – Cochin National Highways(NH 49), just about 10 km to the west of Madurai, on the way to Madurai Kamaraj University. Our School has another importance – the foundation stone was laid on 11.09.1955 and declared open on 15.09.1957 with 183 students by Baratha Rathna Shri K. Kamaraj, the Chief Minister of Tamilnadu. Our School is now running with 2839 students. Qualifications: M.Com with B.Ed. Typing in English Higher will be preferred. Last Date: 15th October 2018.